There's a series of books out there called Something... And Philosophy, where the Something will be something unexpected and pop culture-y, such as Star Trek, or Star Wars, or Lord of the Rings. We always thought it was just marketing tripe to get people into philosophy via their favorite low art setting. Surely Star Trek is the only TV pop which merits a book on philosophy? Apparently not, for there is the movie-length pilot of Battlestar Galactica. Everyone who knows us offline knows that we have a bit of a dystopia fetish. We have a worrying appetite for disaster stories, especially when they are set in the future and/or space, and we prefer all our characters in such stories to be dark, brooding and preferably doomed. "Then you'll LOVE Battlestar Galactica!" our friends chorused. And, yes, we have started the brainwashing, and, yes, we are loving it. But while it presses our usual buttons in a usual way (99% humans killed by angry robots! lone human ark sailing through space to an unknown destination! ensemble bonding! be still, my heart), it also amazes us by being so gosh darned philosophical. We could... well, gosh, we could write a book about it! In the past or future or somewhere, but definitely in media res, it's been forty years since the human-Cylon war, and relations between the two groups are icy at best. One of the last warships of the human fleet, the Battlestar Galactica, is preparing for its decommissioning ceremony, and its crew is all abuzz with its quotidian soap opera motley human drama. There's Kara "Starbuck" Thrace (Katee Sackhoff), the stogie-chomping ace pilot with a big ego and big, cocky smile, there's the grim (and glorious!) Commander Adama (Edward James Olmos, of Blade Runner), his alcoholic XO, Tigh (Michael Hogan), and his son, Captain Lee "Apollo" Adama (Jamie Bamber). There are also a bunch of other people doing a bunch of other things. The point: no one has any idea of the dystopian doom which awaits them, nor will the dystopian doom necessarily drive much of the drama (though it drives a lot of it, admittedly). Meanwhile, on the Earth-like human colony planet of Caprica, the terribly clever, terribly cheeky genius Dr. Gaius Baltar (James Callis) is discovered to be (1) cheating on his girlfriend, Six (Tricia Helfer), (2) who is also, incidentally, a Cylon in disguise (new model!) (3) who has used him for his defense systems knowledge, thus dooming the human race to near-extinction. Moments after Gaius learns this, a bunch of Cylon spaceships appear and the atomic bombs begin to drop. 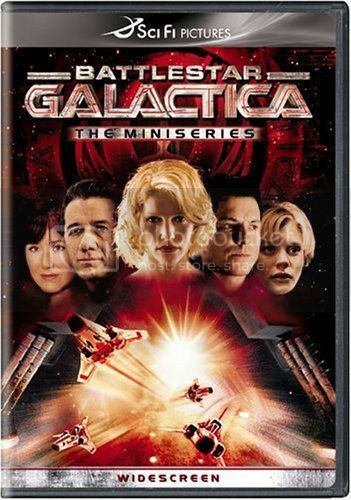 Gaius flees, but not before acquiring Six as a permanent companion via flickering hallucination; also, the decommissioning ceremony is interrupted, all twelve planets of the human colonies are destroyed, and the Secretary of Education, Laura Roslin (Mary McDonnell), becomes the new colonial President. Not since Pasqualino Settebellezze has a film made us muse on the right to survive. But this movie-length pilot sets up a number of fruitful (and fairly typical) sci-fi themes: What makes us humans, when Cylons look, feel and act like us? What is free will and consciousness, in an age of artificial intelligence? As the first scene shows, a Cylon asks a human, "Are you alive? Prove it." Or, as a character from the new spin-off series says, "A difference that makes no difference is no difference." This is all par for the course - we've seen it before in movies like Blade Runner or books like Neuromancer - but BSG seems to be looking at it from an interesting angle: if the point of the human-Cylon conflict is that there is some fundamental difference between being human and being Cylon, and if humanity's uniqueness comes from its loftier ambitions (justice, mercy, compassion, blah), then what do we make of humans who must continuously do awful things in order to save themselves? That is, when the biological imperative of surviving drives out all the loftier concerns, the lines between human and Cylon are not just blurred - they're erased. Pasqualino Settebellezze and BSG's pilot both demonstrate how surviving for surviving's sake can lead to some very nasty moments indeed. Or, let the PPCC rephrase: while Pasqualino unambiguously portrays the moments as nasty, BSG leaves the questions hanging. Two examples. First: there are a number of scenes in the pilot where the remaining humans (now numbering 50,000), have to choose to either let some X number of humans die (where X<<50,000) in order to save the majority. The characters agonize over this, but the conclusion is always the same: the majority wins. It has to. But the lingering doubts remain: Does it really? We can't be sure that the decision to survive, at the expense of an unlucky minority, was right or wrong. BSG impressed us by presenting these difficult questions for what they are: pretty unanswerable! Incidentally, there's a great game about this on the PhilosophersNet: Morality Play. Second example: there are two notable scenes in which a major character admits that, even in the face of our species' worst crisis imaginable, they are still more concerned with their individual fate. These two characters are Gaius Baltar, who is concerned that the other 49,999 people will soon learn that the genocide was partly his fault, and Laura Roslin, who learns early in the pilot that she has cancer. Here, too, BSG emphasizes the ambiguity: Baltar is mocked by his hallucination-Cylon (who begins to sound increasingly like a sort of Jiminy Cricket-style disembodied conscience) for his selfishness, and Roslin is reassured that her feelings are normal, nay, characteristically human. So who's right? Does the victimless nature of Laura's doom erase her selfishness, redefining it as humanity? With such a large cast of characters, it's easy to find your personal favorites. Our favorites are Commander Adama and Gaius Baltar, who are brilliant in radically different, clashing ways - like ice cream and cheese. But the performances by all the actors - particularly Mary McDonnell as Laura Roslin, Paul Campbell as her assistant Billy, and Katee Sackhoff as the swaggering Starbuck - are very good. We look forward to seeing how the characters and the themes (especially free will, given all those creepy sleeper Cylon agents!) develop over the next four seasons. I'm currently watching season 4 of the series after finally starting it over Christmas break, and I'm loving it. I like that it's philosophical, but also has storylines that do with the innerworkings of the government and military. And I love Starbuck. Ooh, we're in mid-Season Three. Battlestar Galactica is full of crunchy chewy philosophical (and theological!) goodness. So far, it just keeps getting more complex. And for the record, my favorite character is Tigh, which I would NEVER have believed when watching the miniseries in the beginning. Hey, is that -- actual character development? On the Sci Fi Channel? Wow. Have you read Jacob at Television Without Pity's recaps of the show? He started around season two and his musings on the meaning of life and the show and life in the show are quite up your alley I think. Kelsy - Agreed. It's got so much to say! Starbuck is da bomb. Anarchivist - I made the BIG MISTAKE of starting to read Tigh's Wiki entry, which basically started giving away some MAJOR FACT which I am still unsure of. This happens every time I read a BSG wiki entry, so I am not stopping. But my point: yes, he seems very interesting as well. They all do! I'm in season 2, and Sharon has become my favorite. Well, after old Adama. Ajnabi - Ooh, thanks for the rec! I'll start reading those once I'm sure I won't get spoiled on every new development (as I have been thanks to that damned wiki). This is one of the few shows that actually had me depressed when the final episode faded to black. The character development just gets more and more complex and every few episodes there is one that explodes into a WTF moment. The show is truly unsettling and every revelation just leads to more questions. Sanket - Oooh, man. You make a dangerous request. I have 2 half-written BSG episode reviews on my laptop, and I was chiding myself to bring some diversity back to the PPCC. But diversity bedamned, it's BSG Forever time! And word up re: it becoming more and more unsettling. I just watched the truly dismal episode from season 2 about the Woe of the Pilots, and I had to have some mango juice just to cheer myself back up. Oh, the humanity! Will PPCC be participating in the first week of May's Vinod Khanna festival? You don't want to forget where you came from, right? And PPCC has written many insightful reviews of Vinod's films. But so much more can still be said. Or even repeated! So I'm hoping that when the time comes for Vinod Khanna appreciators to be counted, PPCC will not be missing, off pondering character development in another galaxy. This show sucker-punches you again and again, darn it. I'm pretty sure I have two black eyes and stitches in my upper lip by now. PPCC, once you reach the episodes of season two, each one was reviewed as it aired, so if you've seen the episode the recap won't spoil anything for you. Just... don't read the synopses of the future episodes. They don't usually give too much away but when they do it's kinda extreme. what matters most - You shame me! Oh, the shame. How can I deny my masala heritage? You're right. Also, you're serendipitous. I was just talking Vinod Khanna at a recent retreat. Clearly, a sign! And I've always wanted to watch that classy 80s romance he made with Shabana. If only I could find the title! ajnabi - Yes, I KNOW! They gave away a major character death in the tiny little synopsis. Curse my eyes for browsing!